The Chief of Staff Government House and Protocol, Dr. Festus Okubor has challenged Youth Organizations in the State to embrace globalization so as to foster oneness in the State. 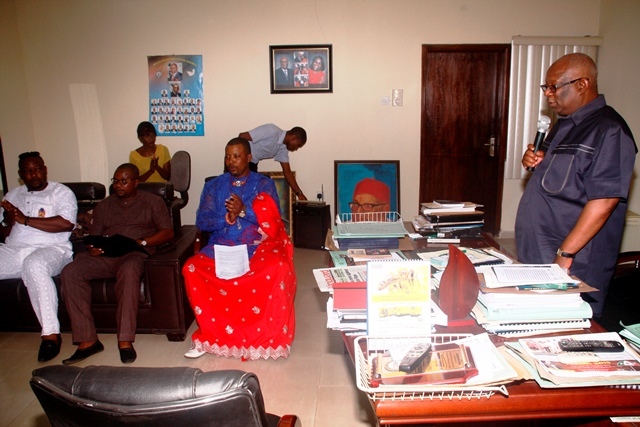 Dr. Okubor gave the challenge when members of the Urhobo National Youth Congress paid him a courtesy visit explaining that we are in the era of globalization as such youth bodies should key into it for unity and oneness to strive in the country. He opined that the country would do better if the youths accept globalization and work towards it as a way to foster unity rather than be restricted by ethnic sentiments which brings about division. The Chief of Staff charged the group to spread the spirit of oneness among them and other youth bodies for the common good of the State/country. Dr. Okubor advised the group to be active members of the Peoples Democratic Party as they had pledged their loyalty to the party and the State Governor stating that they would achieve success as party faithful if they avoid distractions and support the party faithfully. He commended the organization for their support for Governor Uduaghan’s administration stating that the Governor was busy transforming the State for the benefit of all Deltans and not for any particular ethnic group. In a welcome address, the National President of the Urhobo National Youth Congress, Comrade Nicholas Evwienure said the group was a socio-political body drawn from the twenty-four kingdoms of the Urhobo nation and has the prime focus of fighting for the socio political emancipation of Urhobo youths and the Niger/Delta youths without recourse to violence. He observed that the Urhobo people had been marginalized but have resolved to follow the path of intellectual peace, progress and unity as a way forward for political, social and economic recognition from the Nigeria Government. Comrade Evwienure appreciated the State Governor, Dr. Emmanuel Uduaghan for his goal-driven vision and humanitarian disposition in the development of all parts of the State. He finally highlighted the activities of the group to include monthly visitation to hospitals, orphanage homes, prisons for free distribution of the Holy Bible, tracts and food items to inmates, the fund raising for the medical surgery of an abandoned 13 years old Urhobo girl in University of Benin Teaching Hospital (UBTH) Charity Ovekwarao who was suffering from neurological platoma from birth as a result of oil and gas pollution in Urhobo land.